Some AIX software is optimized for installation from a graphical user interface (GUI). If you need an AIX GUI, you can enable a Skytap AIX VM as an X11 client over an SSH published service and connect to it using an X Windows GUI. X Windows on an AIX VM requires a minor configuration change to the AIX VM, as well as the installation of an X11 server and SSH client on your local computer. Add a published service to the VM to enable an SSH connection, and enable X11 forwarding in the AIX VM OS settings. Follow the steps in Adding a published service to a VM. In the By name menu, choose SSH Server (port 22). Note the host name and port number of the published service. 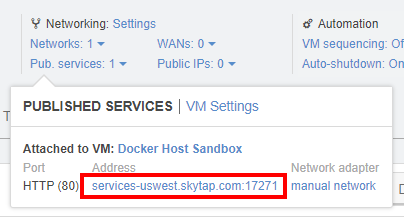 In this example, host name is skytap@services-uswest.skytap.com, port number is 24991. With the AIX VM running, open an SRA client Secure Remote Access client – A browser access client that provides quick access to Skytap virtual machine desktops. To learn more, see Accessing VMs with your browser. . Within the SRA client view of the AIX VM, edit /etc/ssh/sshd_config. Uncomment X11Forwarding and set it to yes. Your local computer needs to have an X Windows server installed. If you’re using Windows or macOS, install an X Windows server. If you’re using Windows, you also need to install an SSH client. If you’re using a macOS local computer, use the built-in Terminal. 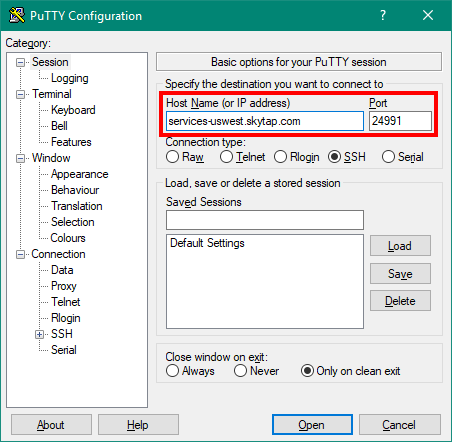 Windows – Download and install PuTTY. Click Connection > SSH > X11. 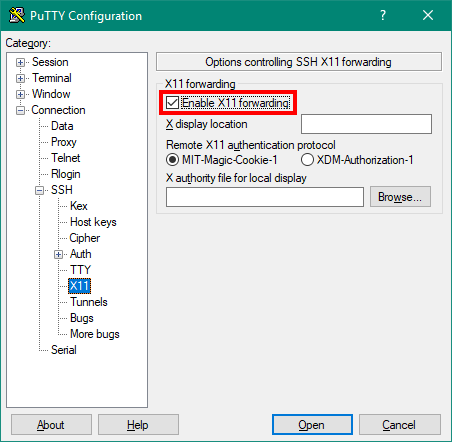 Check the box next to Enable X11 forwarding. Start the local X Windows server (VcXsrv or XQuartz). Start an SSH connection to the AIX VM. in the Host Name (or IP address) field, type the host name and port that you noted when you set up the published service. Click Open to start an SSH session with the AIX VM. In the PuTTY terminal window, sign in to the AIX VM. Type startx to start X Windows. Type ssh -Y -p <port_number> <username>@<hostname>. For example: ssh -Y -p 24991 skytap@services-uswest.skytap.com. Sign in to the AIX VM.